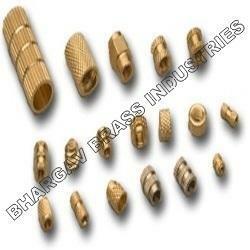 We are one of the largest manufacturers of Brass Threaded Inserts used for plastic moulding. 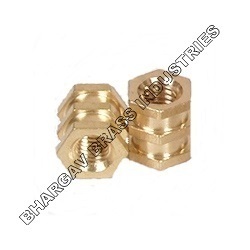 Material: Generally Free Machine Grade of CuZn37Pb3 equivalent to BS 2874 is used to manufacture various brass threaded inserts in form of round, Hexagon, Square etc. Other grades which are followed as per custom requirements are CZ 121 , CZ 131 , C3604, CDA 360, and DTD 627. etc. 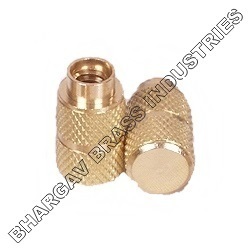 Finish: Generally Brass Inserts comes with the Natural, Nickel & Tin Finish. But Surface Finishes such as Chromium, Silver, Gold, etc. can be done as per customer’s requirement. With the firm commitment to quality, we able to come forth with premium quality Brass Molding Inserts for our respected patrons. These offered products are widely utilized in various engineering related industries and other areas, these products are widely appreciated for their optimum performance and seamless finish. 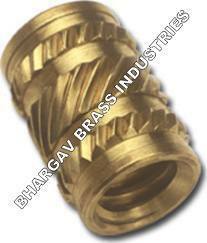 We are one of the leading manufacturer and exporter of Brass Rotational Molding Inserts. These products are widely utilized in industries and other concerned areas, these products are extensively demanded and appreciated by the large number of clients. We utilize optimum-grade raw material, purchased from the the most authentic vendor to fabricate these offered products. 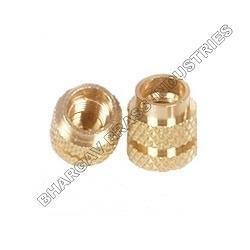 We are a leading manufacturer of Brass Rotational Molding Inserts as per custom design and specification. 3mm 4mm 5mm 18mm 20mm 24mm 25mm 26mm 28mm 30mm 32mm 33mm 40mm 50mm M3 M4 M5 M6 M8 m10 m12 m16 M18 M20 M24 M25 M26 M28 M30 M32 M40 M50 1/8 5/32 3/16 1/4 5/16 3/8 1/2 7/8 3/4 1 11/4 11/2 2 2/12 6mm 8mm 10mm 12mm 16mm. 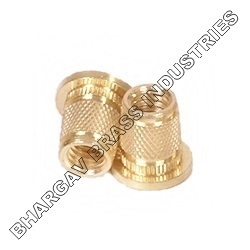 Backed by rich industry experience, we are engaged in manufacturing and supplying a commendable range of Brass Electrical Inserts. These Inserts are made using quality material and are durable, easy to use and maintain as per requirements. These products are used in various industries in various specifications that perfectly suit to required needs. 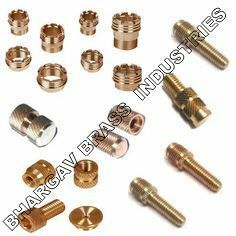 Brass Helical Inserts are compact Inserts suitable for insertion in all types of plastics and can be used with hot plastic molding and cold plastic molding. These Inserts are best suitable for electrical molded box applications. 3mm , 4mm , 5mm , 6mm , 8mm , 10mm , 12mm , 16mm , 20mm , M3 M4 M6 M5 M8 M10 M3.5 M12 M16 M20 1/8", 5/32", 3/16", 1/4", 5/16", 3/8", 1/2", 3/4", 1", UNF, BSP, Metric, UNC, UNEF, BSF, NPT, BSPT, R, G Threads. 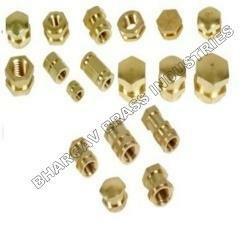 In order to remain at par, we are providing a wide range of Brass Molded Inserts to our patrons. The product we offer product find their application in various engineering industries and other areas, these products are widely appreciated for their trouble free operation and zero defect finish. Apart from this, patrons can avail these products at market-leading price. We offer our esteemed clients with quality-assured Threaded Molding Inserts used in various engineering related industries, these products are well-known for their optimum performance and seamless finish. We utilize optimum-grade raw material and machine for manufacturing these products. With the support of our expert team-force, we able to come forth with premium quality Molding Inserts for our respected patrons. These offered products are widely utilized in various engineering industries and other areas. The products we offer are widely appreciated for their optimality and durability. With the aid of our procuring agents we are offering our precious patrons Molding Inserts which are highly efficient in their respected application. These quality products are fabricated using optimum-grade raw material, to ensure their adherence with high standard and durability. 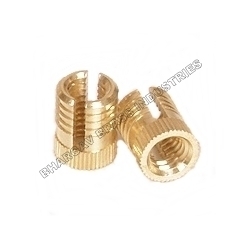 Looking for Brass Electrical Inserts ?